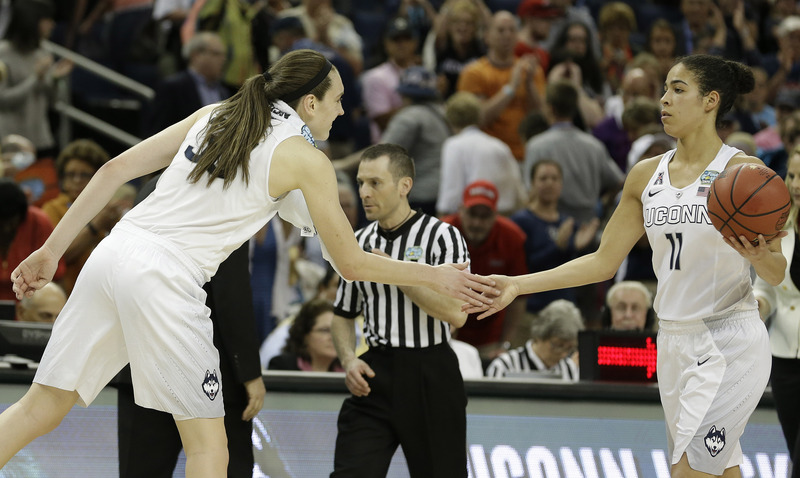 TAMPA, Fla. -- Breanna Stewart and Morgan Tuck have UConn back in the championship game for the third straight year. Now the Huskies are one victory away from a third straight title. Stewart scored 25 points and Tuck added 24 to lead UConn to an 81-58 win over Maryland on Sunday in the Final Four. UConn will face Notre Dame for the title on Tuesday night in a rematch of last season's championship game. The Huskies have won nine titles overall and a victory over the Irish would tie Geno Auriemma with vaunted UCLA men's coach John Wooden for the most all-time with 10. It would also be the second three-peat for UConn, which won three straight championships from 2002-04. Making the Final Four seems like a rite of spring for the Huskies (37-1) lately as the team has appeared in the last eight national semifinals. UConn had cruised through the NCAA Tournament, but Maryland coach Brenda Frese said her team wouldn't be intimidated by the Huskies. The Terrapins took it right at them from the start, hanging with UConn for the first 10 minutes. Maryland only trailed 22-19 before UConn scored seven straight points capped by Kaleena Mosqueda-Lewis' 3-pointer that made it a 10-point game. Maryland (34-3) didn't back down getting back and pulled within 39-33 on Lexie Brown's 3-pointer with 1:52 left in the half. She scored the final five points of the half to give the Huskies a double-digit advantage going into the break. Tuck missed last season's championship run while she was recovering from microfracture surgery on her right knee that allowed her to only play in eight games. The redshirt sophomore made her presence felt on the game's biggest stage, finishing just two points short of her career high. She started the second half with another 3 as UConn scored the first nine points to break the game open. Her layup capped the burst and gave UConn a 53-33 advantage. The Terrapins could only get within 14 the rest of the way as Stewart and Tuck answered every Maryland run. Stewart, who was The Associated Press Player of the Year for the second straight season, added eight rebounds. The loss ended a school-record 28-game winning streak for Maryland, which hasn't won in its four meetings with the Huskies. Brionna Jones scored 14 points and Lexie Brown added 12 to lead the Terrapins, who cruised through the Big Ten in their inaugural season in the conference going undefeated. Brown had some extra support at the game as her father, former NBA slam dunk champion, Dee Brown was in attendance. He is an assistant coach with the Sacramento Kings and was able to skip their game Sunday and see his daughter play for the first time this season. He was sitting near former Celtics teammate Pervis Ellison, whose daughter Aja also plays for the Terrapins. Former NFL star Donovan McNabb was also in the crowd cheering on his niece Kia Nurse, who is a freshman at UConn. The former athletes weren't the only stars at the game. Three-time Academy Award nominee Tom Cruise was sitting in a suite, though it wasn't clear who he was rooting for.